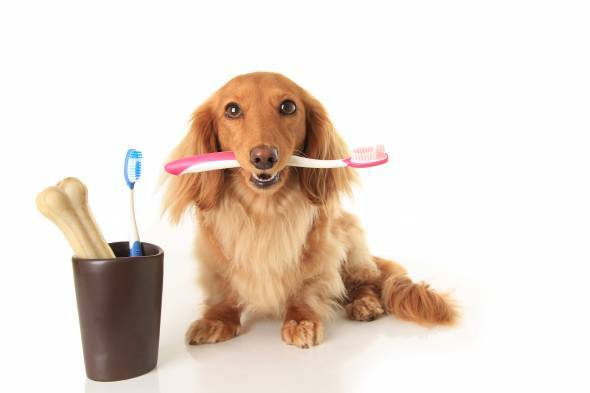 Just like humans, dogs need regular teeth brushing. In just 2-3 days, naturally occurring bacteria in your dogs mouth will mix with food residue and form plaque. Over time, the plaque will combine with minerals in the saliva and result in a build up of tartar. Once plaque and tartar have gained a foothold, your dog runs the risk of developing gingivitis, inflammation of the gums, a condition which is not only painful, but can lead to the loss of teeth. As tartar removal should only be performed by a vet, brushing your dogs teeth at home will not only keep your dog healthy and happy, but save you from costly veterinary bills. A puppy has grown its first set of teeth when it reaches around 5 weeks of age. At the age of 4-6 months, those teeth have been replaced by the dogs adult set of teeth, 42 in total. Hopefully, those teeth will last your dog for the rest of his life. Ideally, you should begin when your dog is a puppy, but its never too late to start. As with all dog care, the more frequently you do it, the more easily your dog will get used to it. Just keep the sessions short in the beginning, never letting them turn into a struggle, always giving your dog praise. Use a baby toothbrush or a toothbrush specially developed for dogs. For instance, there are double-sided toothbrushes that will brush both the inside and the outside of the teeth at the same time. Whether or not you are using a grooming table, try standing or sitting behind your dog while you brush his teeth. That way you can more easily replicate the movements you use when brushing your own teeth. Do around a dozen brush strokes on each section of teeth, maybe less in the beginning until your dog gets comfortable with it. Make sure that both the teeth and the nearby gum area get brushed. A good way to encourage your dog is to use dog toothpaste. 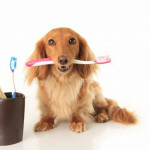 Dog toothpastes come in different flavors, such as chicken or liver, to make the experience more palatable to the dog. Never ever use toothpaste for humans as it is far too strong and meant to be rinsed out, something your dog does not know how to do. Make sure to brush your poochs teeth at least 2-3 times a week. If you can do it every day, so much the better. There are a number of products on the market, powders to be added to the food, liquids to put in the drinking water, chews, etc, aimed at helping remove plaque. However, just as with your own teeth, its only by actually brushing that plaque is properly eliminated.